$20,000 reward for Obama's college records here. You have to actually look to find something. The mainstream media turned up Dzhokhar Tsarnaev college transcripts in two days. They haven't found Obama's after over four years. Dzhokhar Tsarnaev had done well academically in high school, but The New York Times reported that he was failing many of his courses at UMass Dartmouth. The Times said a school transcript showed seven failing grades over two semesters in 2012 and 2013, including Fs in Principles of Modern Chemistry, Intro American Politics, and Chemistry and the Environment. According to the transcript, Tsarnaev got a B in Critical Writing and a D and D-plus in two other courses. The UMass Dartmouth campus in the southeastern part of the state closed early Friday morning after school officials realized the younger of the two men authorities said were responsible for the Monday bombing was a student there. Of course, I could be wrong. 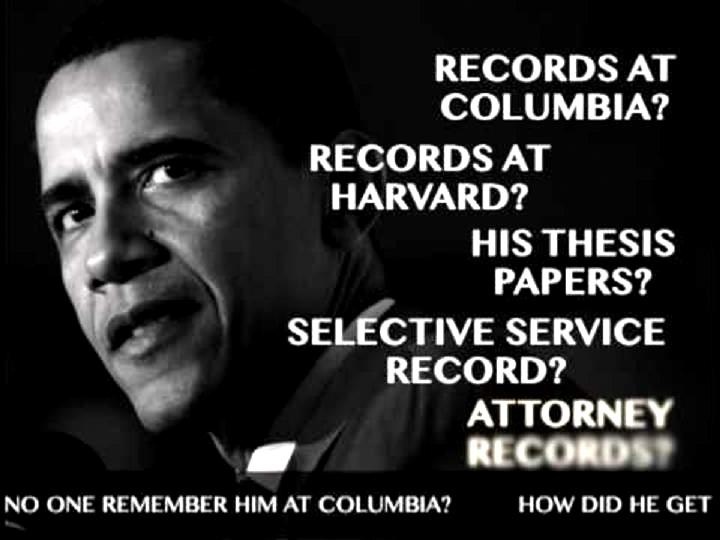 It is entirely possible some Obama fan-boy or girl in the mainstream media has Obama's college records and just won't release them because they are damaging. The reason Pres. Obama's transcripts haven't been released is because of FERPA regulations, which state that no one's college records can be released without their consent, unless there's a compelling legal reason (i.e. they're the subject of a criminal investigation). Obama was editor of the Harvard Law Review, and he taught constitutional law at the University of Chicago. He has clearly shown that he is capable of the highest level of academic achievement. Any insinuation otherwise is blatantly racist. It's an ugly attitude, and you should know better. Wake up, for goodness sake this arrogant man has pulled the wool over your eyes. Why won't the President (who by the way, if I'm not mistaken claimed this administration would be "transparent",BWAAHAAHHAAAAA)give permission for the transcripts to be released? THAT'S the thousand dollar question Drew, Why has THIS President spent millions of personal dollars, and countless taxpayer dollars to defend him NOT releasing the transcripts? Care to take a stab at that quesion young Drew? I have read ONE, countum ONE article written by Obama, and it read like a "Utopian" wishlist of crap, NOT reality, but by golly geepers, he sure WAS the "editor" of the Harvard Law Review. I'm sure, I mean I almost POSITIVE that an "unnamed" middle easterner who wrote a letter to Harvard to get Obama admitted, had NOTHING, and I mean NOTHING to do with Obama's "position" at Harvard. IF Obama "taught" Constitutional law at the University of Chicago, show me. I'm thinking you can't. I think this is "embellishment" like his so called "girlfriend" in his work of fiction known as his bigraphy. AND if he has any idea about the Constitution, he would know the part of the Constitution that gives the requirements to be President, which states that you must be 35, a NATURAL BORN CITIZEN, and have lived in country for at least the last 14 years. Obama's NOT a "Natural Born Citizen" and NOT because he wasn't born in Hawaii. It doesn't matter if he was born in the Lincoln bedroom, Obama could NEVER be a "Natural Born Citizen". 2. Born to US citzen parentS. In other words, born ONLY a US citizen. Obama was born a British Subject also, and had DUEL citizenship at the time of his birth. The place where he was born is a distraction concocted by your guy Obama, and the main stream media. You claim he has "clearly shown.........blah blah blah........achievement. He has shown the ability to spew rhetoric that the SHEEPLE (yes you Drew) eat up like oats. YOU need an intervention Drew. And if I may...............NOT ONCE did I bring up the President's race, or the race of his parents. YOU suggesting that "Any insinuation otherwise is blatantly racist" shows your desperation. But stay at it Drew, your side is winning, no doubt about it. But OUR side is RIGHT, and it doesn't matter if there's one of me, or tens of millions of us. I can sleep at night KNOWING I know the truth. "The reason Pres. Obama's transcripts haven't been released is because of FERPA regulations, which state that no one's college records can be released without their consent, unless there's a compelling legal reason (i.e. they're the subject of a criminal investigation)." That didn't stop the media from getting the Boston bombers and don't play the criminal investigation. That exception isn't for the news media.